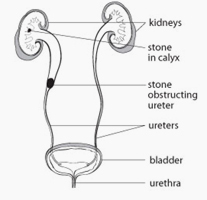 Some stones will pass in the urine without specific treatment. Frequently however, therapy is required for the relief of pain or obstruction. In some situations, a stone is best removed surgically with instruments passed through the urethra or through an incision. 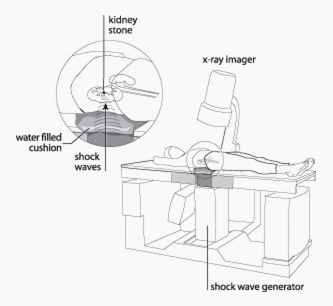 Shock wave lithotripsy (“stones crushing”) (SWL) is a non-surgical treatment in which high energy shock waves are used to pulverize a stone into smaller fragments which will pass more easily and with less pain. A special machine, which may not be available at your local hospital, is used to generate shock waves. X-rays or ultrasound are used to focus the shock waves precisely on the stone. The shock waves pass harmlessly through body tissues until they hit the hard stone causing it to break up. The fragments can then flush out more easily in the urine. Very hard stones, although this may not be apparent prior to treatment. Patients who are very overweight, because shock waves may not be able to reach the stone. During any stage of pregnancy, in most cases. Other treatment options will be considered for these patients. Special precautions may be required for SWL in those with cardiac pacemakers. If you have a pacemaker, please advise the lithotripsy unit in advance. Some stones will require more than one SWL treatment for complete clearance. Before the treatment we will determine whether your stone problem can be treated with SWL depending on the size, number, location and expected composition of the stone(s). Recent imaging, by X-ray, ultrasound or CT scan, is necessary prior to treatment. A stone should be visible on plain X-ray (often called a KUB) to allow adequate targeting for SWL. This X-ray should be taken prior to referral for SWL, if it is not already available. Urine and blood tests, as well as an electrocardiogram, are generally required. Urinary infection should be controlled with antibiotics before SWL. SWL generally is performed as an out-patient procedure. Overnight hospital admission is rarely necessary. Restriction of diet and fluid consumption for several hours prior to your treatment may be necessary. Special instructions will be given for patients with diabetes. Most usual medications should be continued. Bringing a list of current medications for your SWL appointment is helpful. Patients taking warfarin (e.g. Coumadin™) must contact a doctor for special instructions. Do not discontinue warfarin without consulting with your doctor. Shock wave lithotripsy cannot be performed if you have taken warfarin within the 6 days prior to your treatment date. Aspirin (e.g. Entrophen™) or medications containing aspirin. SWL may be cancelled if arrangements have not been made to be taken home by a responsible adult after treatment. On arrival an X-ray may be taken if recent imaging studies are not available. An intravenous line will be started to administer a sedative and/or painkilling medication as required. The patient is positioned comfortably on the lithotripsy machine after which the stone will be targeted with X-rays or ultrasound. A water-filled cushion will be pressed between the shock wave generator and the body to conduct the shock waves. It is important to lie still during treatment so that the shock waves can be targeted accurately on the stone. During the procedure one can hear a clicking sound and feel a tapping sensation as each shock wave enters the body. Several hundred shock waves are generated over 30 – 45 minutes, until the stone is adequately fragmented or a maximum number of shocks have been delivered. After treatment is completed, a final X-ray is taken. A prescription for pain killers will be given as needed and instructions regarding a follow-up appointment with a doctor in a few weeks. Long distance travel is inadvisable immediately after SWL. A patient may pass stone fragments for a few weeks after SWL. About 80% of patients treated with SWL are stone free by three months after their treatment. There may be pain and mild bruising of the skin where the shock waves entered the body. Aching back or flank pain may accompany the passage of stone fragments, particularly in the first few days. Mild pain can often be controlled with acetaminophen (e.g. Tylenol™) or ibuprofen (e.g. Advil™). It is not unusual to see blood in the urine for up to one week. Clearing of blood and flushing stone fragments will be facilitated by drinking at least two litres of fluid every day for the first few weeks. Most people are able to return to work and resume their usual activities when they are comfortable, usually within a day or two of their SWL treatment. Risks of shock wave lithotripsy Heavy bleeding is rare after SWL. Internal bruising in or around the treated kidney is occasionally seen. Fever, chills or shakes after SWL may indicate infection. Medical attention should be sought promptly so that treatment can be provided if necessary. Occasionally, blockage of a ureter after SWL will require additional treatment, including surgery, for relief.